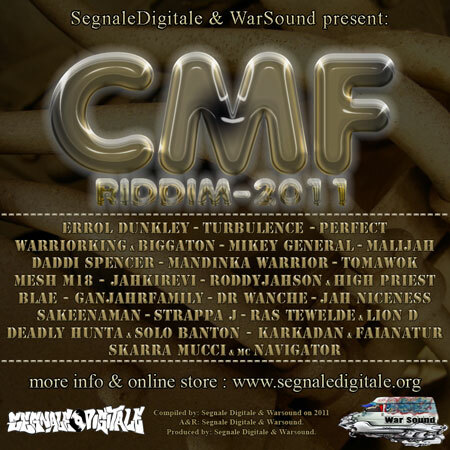 I cantanti che hanno accettato di cantare sul “CMF RIDDIM” sono Errol Dunkley, Turbulence, Perfect, Warrior King & Biggaton, Mikey General, Malijah, Daddy Spencer, Mandinka Warrior, Tomawok, Meshm18, Jahki Revi, Roddi JahSon & HighPriest, Ganjahr Family, Dr Wanche, Ras Tewelde & Lion D, Sakeenamen, Blae, Strappa J, Jah Nicenes. 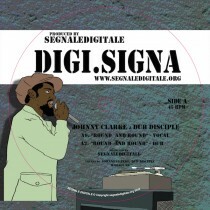 Le versioni finali sono state tutte prodotte da SEGNALE DIGITALE il riddim CMF e’ stato originalmente prodotto da Catchy per Greezly Productions e poi mixato e masterizzato da SEGNALE DIGITALE. 1. 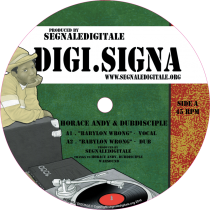 Errol Dunkley - "Dancehall Stile"
2. Turbulence - "Rasta Forever "
3. Perfect - "6x7x8 Spliff"
4. Warrior King featuring Biggaton - "Always"
5. Mikey General - "Unconditional"
6. Malijah - "Start Revolution"
7. 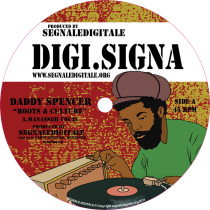 Daddy Spencer - "Bring Love"
8. Mandinka Warrior - "My Gyal"
9. Tomawok - "ça me rend digidigidingue"
10. Meshm18 - "Bikiny wach"
11. Jahki Revi - "Critical Master Flowa"
12. Roddi JahSon & HighPriest - "Cmf"
13. Ganjahr Family - "No Podran"
14. Dr Wanche - "Vamos Adelante"
15. Ras Tewelde & Lion D - "Tell My Why"
16. Sakeenamen - "Stessi Punti Di Vista"
17. Blae - "Blae Doug"
18. Strappa J - "Ghetto Youth"
19. Jah Nicenes - "Rasta Got Swag"